Over the years, I’ve read a lot of books. While I consider myself a precognitive that gets flashes of what’s to come from time to time, it’s amazing how flat-footed I can become after a great plot twist has been revealed. As a fan of sci-fi and fantasy, I’ve read a lot of far-out novels, but I have to admit, some of my favorites have featured psychics like myself. In modern media and literature, there are a ton of great stories with characters that display special abilities, which I find particularly cool. As I was reading through one of my favorite Heinlein novels, I decided to write about some of my favorite psychic characters in literature, so here we go! I am a big fan of Robert A. Heinlein; stories like Starship Troopers will always be classics. Stranger in a Strange Land has been one of my favorite stories since I was a teen. Its tale of a young Martian human and his visit to the planet of his parent’s birth (Earth) and the social changes that started to happen there as a result of his visit. Valentine Michael Smith soon starts to exhibit Martial mental powers and intelligence and begins to show all of the friends that he makes that the Martian life is a more connected life. The themes of the book are deeply transcendent and spiritual for a sci-fi novel, which is something that appears often in Heinlein’s novels. If you are a psychic or you’re just a spiritualist that believes in the connected nature of everything in creation, this is a great novel for you, with great psychic characters like Valentine Michael Smith. 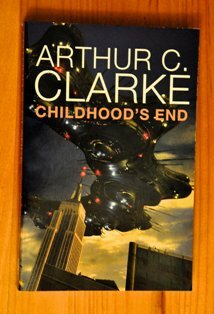 Another novel that has a theme of transcendence, Arthur C. Clarke’s Childhood’s End tells the story of humanity’s first contact with a species that came to be known as the Overlords. Following their arrival, things start to change for the human species. War is almost completely wiped out and health and happiness become completely attainable by everyone on the planet. The psychics of this story I like to call the Children, and when you read the novel, you’ll see why. These characters exhibit strong psychic abilities that are amazing. The theme of the novel is a universal connectedness, which I think is right up the alley of many of the psychics and spiritualists of today. Give it a read! Dune is one of the more famous novels in this list, mostly due to the David Lynch movie of the same name from the 80s. Frank Herbert’s Dune tells the story of a young lord, Paul Atreides, and his journey on the desert planet of Arrakis, which has also come to be called Dune. During the course of his adventure, it quickly becomes clear that young Paul is a powerful psychic and the results of his revelations on Dune will change the universe. While the themes and psychic abilities in Dune are a little more fantastical when it comes to its narrative, the characters such as young Paul are well-developed and interesting. Dune is a classic that is well worth a read and differs from the story told in the film (and television miniseries) in several distinct ways. Firestarter, which is a novel by Stephen King, is another great story that also exists as a film made in the 80s. There are actually two psychics in this story; the father, Andy McGee, who has the ability to influence the minds of others by “pushing” them and his daughter, Charlie, who is a powerful pyrokinetic. The adventures of the two characters are harrowing as they are fleeing a government agency called “The Shop” that gave them their psychic abilities in the first place. While Firestarter is more of a thriller than traditional sci-fi, its representation of the powers of the two psychics is pretty riveting. While I’ve never met a psychic with as much outright power as either of the protagonists, I loved the way that King was able to breathe such life into characters without having them play second fiddle to their powers.